While the name will probably conjure thoughts of sugary treats, Milo Confections makes less common, though equally tasty, edibles growing in popularity–marijuana mints. However, you’ll discover these aren’t like most infused breath fresheners on the market. Let’s take a look at their mints. 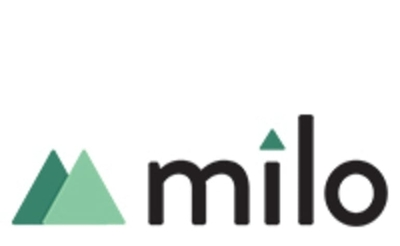 Officially launched this past April, Milo Confections is a L.A. based brand with a simple mission: create superior cannabis infused mints that bring the plant’s benefits to any lifestyle. The company prides itself on valuing patient feedback to continually improve their mints. Founder Patrick has extensive experience working with dispensaries, exposing him to varied cannabis patients dealing with different conditions, goals, and preferences. This insight helped him identify common factors all patients look for: high quality ingredients, consistent dosing, and well marked packaging. 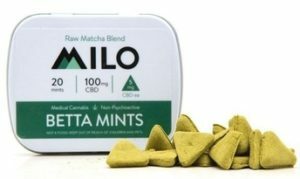 Milo “Betta” (better) mints are vegan-friendly and gluten-free, made using only high quality ingredients, cannabis included. The brand infuses mint, the base of all their products, using raw California cannabis distillate, one of the cleanest extraction methods available. The Milo Confections team has developed a proprietary delivery method so their infused mints quickly deliver comfort, calm, and relief. Patrick’s bio-chemistry background ensures strict and specific care; all dosages accurate and mixed with fatty acids to increase absorption. Naturally, Milo Confections prides itself on consistency, using SC Labs to test their mints for potency and purity. Precise and stable dosing allow patients to be in control of their medication, giving them the comfort of knowing exactly what to expect every time they open a Milo tin. Like the products, their packaging focuses on transparency. Every tin label contains the cannabinoid content, ingredients, dosage instructions, and warnings to ensure you get a perfect, appropriate dose each time. Plus it’s small and discreet, perfect to put in your pocket, purse, or backpack. 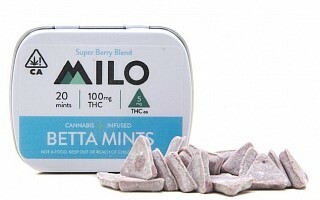 Milo Betta mints are small, triangular, and surprisingly chewy with no cannabis taste. Their consistency and subtlety might remind you of those soft, pastel after-dinner mints you’d find in restaurants as a kid. There are three different formulas/flavors: Super Berry Blend THC, Açaí Berry Blend THC:CBD, and Raw Matcha Blend CBD. Each will give you consistent effects, unique flavor and fresh breath simultaneously! Just be careful: residue might powder your fingers and the top of the tin’s sometimes sticky label. This’ll eventually change, along with a new embossed tin and a hard mint shell, once all government packaging restrictions and regulations have been set in place. So if you’re looking for familiar, light, healthier edibles to use on the go and on the low, these tasty mints are for you. These pure THC mints come 15 per tin with 20mg THC each, totaling 300mg ($20). After trying you’ll immediately taste a blast of fruity berries balanced with just the right sweetness and no artificial taste. Remember, they do produce psychoactive effects so start with one or two then see how you’re feeling in about half an hour. Ideal for fueling a creative and productive day. THC+CBD Betta Mints (around $15) have a 2:1 ratio of THC to CBD, blended with delicious and semi-tart açaí, the super healthy Brazilian berry. Each mint has 5mg THC and 2.5mg CBD, with 20 per tin, totaling 100mg THC and 50mg CBD. With enough CBD to help balance THC’s psychoactive effects, a couple of these are perfect for early morning medicating and all-day consumption. While they do create some psychoactive effects, they’ll be considerably less than their THC-only sister product. Unlike the other two, this cannabis derived CBD-only option blends non-psychoactive benefits with the relaxing properties of matcha green tea. Each mint has 5mg CBD with 20 mints in each tin ($15-20), totaling 100mg of CBD. Their relaxing effects are ideal for a nightcap or a day relaxing at home. These mints would also be ideal after a hard workout or a particularly challenging day dealing with chronic pain. Perfect for patients weary of psychoactive. 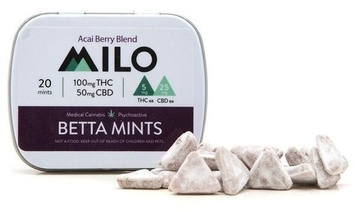 Milo Confections mints are available in several California MMJ dispensaries. You google medical shops to find them, or you can use Nugg’s medical marijuana delivery service to locate local ones that carry and deliver Milo Confections straight to you. It’s free to sign up, but you must have a valid medical marijuana recommendation before ordering. Don’t have a valid cannabis rec? Don’t worry, NuggMD makes it easier than ever by having licensed cannabis doctors available online every day. After meeting the criteria and being doctor approved via live video conference, you’ll get your medical recommendation for only $39. Then visit Nugg and instantly start ordering! “[The CBD Betta mints] tasted pretty pleasant…right after taking them it almost felt similar to after I take an anti-anxiety medication. There’s kind of this tingley, relaxed-ness.” – Marissa S.
“As a youtuber that reviews 420 products I get a lot of samples to try. Milo Confections has been one of the best by far! Great mints that deliver real medicine and don’t have an overtly ‘green’ taste to them. Any patient looking for a way to medicate discreetly at work/school should look into these guys!” – Mike D.